Fully loaded oat squares. Thank you, Nutritiously. I find grocery store options to be lacking when it comes to healthy and delicious on-the-go snacks. 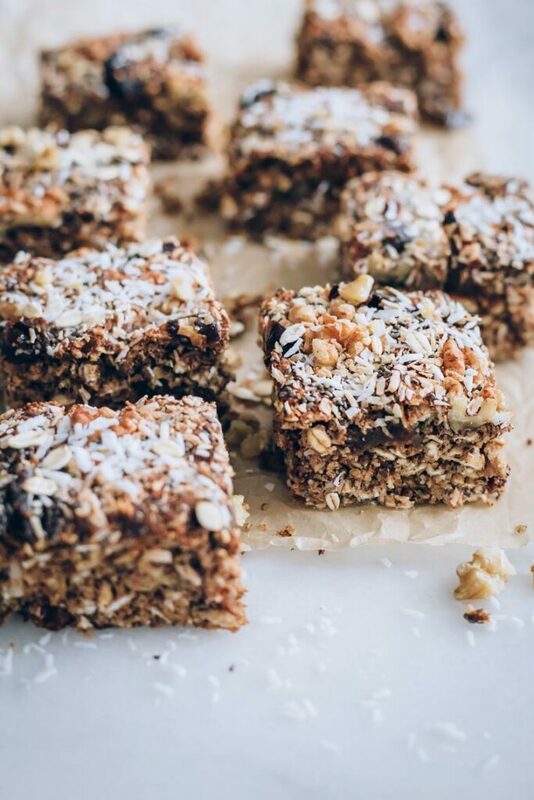 We recently discovered these banana oat squares and are loving them (and the fact that they are vegan and dairyfree). I reach for them when my kids declare they are (finally) hungry just as we are leaving the house, or when we’re heading from school to sports. They also pair well (perhaps too well) with tea or coffee as a healthy treat for the big kids! The core ingredients are oats, whole wheat flour, and banana. We also included walnuts and chia seeds to boost the good fats and plan to try them without walnuts to make them school-friendly. The recipe is flexible so have fun tweaking it and please share! These bars are nutrient dense with solid fiber content (thanks, oats and flour) and a balanced macronutrient profile at about 30% fat, 60% carbs, and 10% protein (% calories). Most of us, including moderately active kids and adults, only need to get 10%-15% of calories from protein – providing we are eating enough food. For my kids, getting enough calories is the main issue as they would generally prefer to play than eat. Fun Fact: Only 8% of the calories in breast milk are from protein! satiety for those losing weight, greater muscle growth for bodybuilder) but aiming for 10%-15% across your day is a solid “base-case”. Learn more here about protein needs in children. Preheat oven to 350F/180C. Prepare your non-stick baking dish or line it with a piece of parchment paper so the bars are easier to lift out. If you quickly want to make your own oat flour, put 1.3 cups (or 120g) rolled oats in your blender or food processor and blend or pulse them. In a large bowl, combine all of the dry ingredients. Your oats, flour, baking powder, cinnamon, and salt. Stir for a few seconds with a spoon. In a different bowl, mash or chop your ripe banana and mix in the soy milk and maple syrup with a fork, mixing thoroughly. Pour the wet ingredients on top of the dry ones and combine well. Add any optional nuts, seeds, or dried fruit and mix further. Put your mixture on to the parchment or baking dish and spread evenly. The bars should be 1-1.5 inches (3-4 cm) high. Garnish with more toppings if desired. Bake for around 18-20 mins, until firm and lightly golden – depending on how thinly you spread your batter and how soft or crunchy you want them to be. Place dish on a cooling rack for 10 minutes, then slice into bars. Cutting into 12 (3×4) gives roughly 120 cal servings. Thank you, supernanny Paula for knocking these out of the park on the first try!